Video (above): Take a look at our promo! 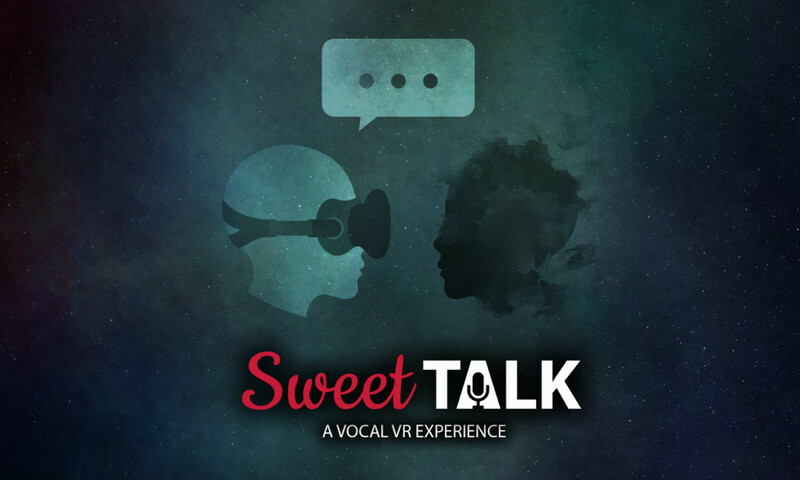 Team Sweet Talk from Carnegie Mellon University’s Entertainment Technology Center explored the use of voice interaction in virtual reality. Given VR’s currently limited interaction options, we explored what novel experiences we could create that would afford deeper character relationships as a result of this unconventional combination of interfaces. Using the natural language power behind both Amazon Echo and Google Home, we tested the limits of character-driven AI by exploring a variety of teaching/learning relationships between our guests and the AI. Scroll down to see a sampling of some of my writings on the team’s design process and discoveries. For a more comprehensive collection of information and updates, please check out our website. 1. Contextual awareness is the key to conversation. Two entities cannot have a conversation without contextual awareness. Without it, a spoken interaction becomes a series of unrelated one-offs. Currently, this is one of the defining differences between the Echo and Home. Google Assistant is able to remember context between transactions, enabling a true conversation, while this is not something Echo can currently do. In our case, contextual awareness extends beyond the verbal into the visual. If our robot doesn’t “see” what a guest is holding, immersion breaks. 2. Non-verbal cues in a face-to-face interaction are interpreted as feedback whether intended or not. Body language has the potential to communicate much more that words in a person-to-person interaction, and the same goes for this type of interaction in VR. For instance, if a character is looking elsewhere, guests assume they’re not paying attention. In our first digital demo, when our little girl stared up at the player, it implied a) a power dynamic in which the guest is in charge and b) that the girl was awaiting instruction. In our latest version, when our robot, Babs, starts beeping and/or looking away, guests understand that she is processing and will wait for her to speak. When Babs looks at the fruit in a player’s hand, they understand she is learning based upon that object. Of course, from the back end, it doesn’t matter at all where she’s looking or if she even had eyes, but that implied contextual awareness is powerful. 3. Expectations from a voice interaction are affected by character species and environment. The little girl model we used at Quarters had a profound impact upon guest expectations from an interaction: they expected her to be able to have a full human conversation. This is why we switched to a robot, a type of character expected to have a more limited understanding of human language. The environment has a strong effect upon the domain of a conversation. For instance, a kitchen has an implied set of associated nouns and verbs. In a kitchen, guests would likely not ask a robot to bring them a lawn mower, or at least they would excuse the robot’s refusal as reasonable. In a context like a warehouse, for instance, expectations are much larger. 4. Today’s voice assistant devices complicate their underlying services. What we really wanted was a chatbot. Both Google Home and Amazon Echo devices put crippling constraints on interactions, including limited attention spans and set invocation words. Having to say “Alexa ask Babs to get me a red fruit” every 16 seconds breaks immersion. This is why we built our own patchwork of services that essentially does the same thing as these devices but without the restrictions. 5. In a voice interaction, guests follow social norms until those norms are violated. Based on our observations, people are generally polite in a voice interaction—even with an AI agent—until they know they can be transgressive. Social norms can be broken by a joke, a delightful discovery of transgressive ability, or even an error thrown by an assistant. In the case of an error, as soon as it’s clear that this is not a normal, well-functioning conversation, suspension of disbelief ends and norms are dropped. This is when abusive behaviors begin. 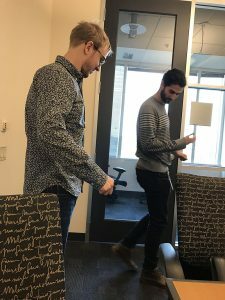 Week 5 was an exciting and eventful week for Team SweetTalk: two prototypes, Quarters presentations, a decision on our direction, bananas, apples, and more! Meet a character you don’t know and with whom you can’t fully communicate. Teach the character how to communicate with you. Use that relationship to achieve something together that you could not do on your own. 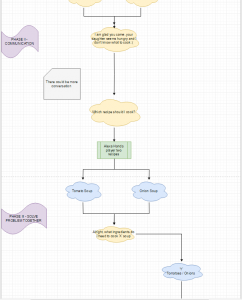 Our digital prototype focused primarily on beats 1 & 2 but did have a simple goal at the end. Using Windows Voice Assistant as a stand-in for Alexa, we created a demo that enabled guests to teach our AI character object descriptors and then ask her to go to go get that object. Then we added a surprise moment at the end when the girl was in danger—we wanted to see if guests would go with their gut reactions and yell “stop!” or if they’d be confused. For this first, very basic demo, we had about a 50/50 response either way, which was great given the fact that it was totally unclear what to do! We thought this would take 15 minutes. It took about 50. Turns out teaching all this basic stuff took quite a while! This was mostly because, even though we stipulated that I had a perfect memory and was a fully verbal adult who just didn’t speak English, Dave’s instinct was to reinforce his lessons and test me at various points along the way. 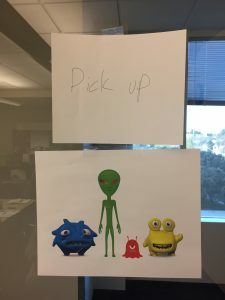 His approach also took a caveman/pet-like direction with both generally single-word interactions and a desire to provide consistent positive reinforcement. Knowing the flaws in our design, our second iteration introduced stops halfway through corridors and eliminated the use of English! 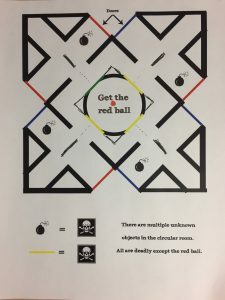 Charlie had the inspired idea that perhaps we should try teaching me in a different language, so I then learned how to navigate the maze in Japanese from our next tester. 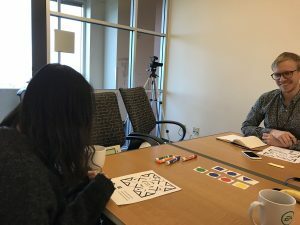 There was a big moment for her when she realized she could use the room around her to teach—something that bodes well for our use of VR in teaching. Initially, the tester tried to teach me forward by moving a triangle towards me repeatedly on the table. But once she realized she could walk, she started acting out and picking up things to make the experience easier to understand and more dynamic. Establish a backstory or relationship so that guests know what do to. This could be done through environmental clues. Have the character speak first. Because she’s human, people expected to talk to her more and ask questions about what she can do and who she is. Players wanted to see more feedback from her body. We don’t want to do a branched narrative. Too many dissatisfying moments. We don’t want to have the expectation for full conversation, aka our character shouldn’t be a fully verbal human, at least in our language. This is because we can’t deliver upon this promise given our scope, technology, and team structure. Interacting with a little girl provoked strong emotions that we really liked. We went through a quick round of brainstorming and have decided to go in the direction of creating a malfunctioning, robotic little girl that we may have created and need to help. Not too many details at this point, but we’ll be exploring this space over the next week. Week 10 was an intense week of change, reflection, and reprioritization, but one with a strong ending. As we started to realize around Week 8, because of our subject matter, our project was becoming—by necessity—a research & development project, as there was a lot of testing and iteration required to really understand why many voice interactions are dissatisfying and how we could build something that avoided those pitfalls with limited technology. It was a tall order! However, we had stumbled upon something really great back in Week 5 with only part of the knowledge we have now. Why, then, was our Week 5 demo so much stronger than out Week 9 demo? Technology was certainly a key reason: our little girl only recognized certain keywords, and in order to give our character a natural language understanding (NLU) that would give the illusion of intelligence, we had to build a new framework from the ground up. That framework is very complex and, as of Week 9, we learned we needed to restart from the ground up a third time. Perhaps more importantly, we misunderstood what was successful in our demo. We thought the joy was in teaching, but really, it seems the delight was in discovering how to teach and then using that common knowledge. We thought the joy was in teaching, but really, it seems the delight was in discovering how to teach. On Monday, Anthony Daniels came to visit, which is always exciting. He took a look at both of our digital demos, and we acted out part of our new soup demo, which was not yet implemented. He enjoyed the empathy he experienced with the little girl but was frustrated because she seemed pre-programmed. As for the soup demo, Anthony didn’t accept the fact that a robot who could speak perfect English didn’t know what a tomato was—the story felt too forced. Carl, our faculty advisor, agreed and added that a) empathy might be tangential to our experience goals and b) that the story was too complex & confusing. With this feedback and the halves feedback in mind, we set out to return to the basics of what we knew would work. 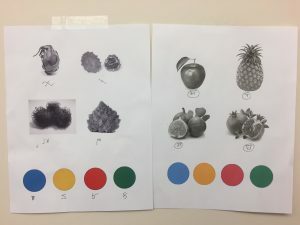 The team had a fruitful debate on Tuesday as to whether or not we could get cooking to be interesting, as teaching ingredients left little room for orthogonal descriptors—for example, it would be very strange to describe a tomato as a red sphere… it’s a tomato. We also debated the merits and downsides of a fetching-centric game: it would certainly be simpler and easier, but what would our new domain be? Kitchens have a nice way of restricting the domain of what a guest would expect to be present that other environments might not. 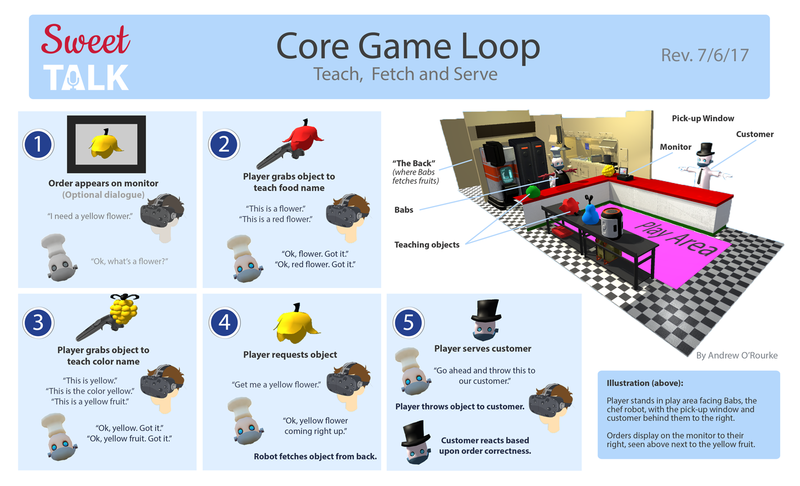 Greeting/introductions: We are in an alien restaurant for its first day of operation, and the player is working with an illiterate robot to serve up orders. She’s at the order window, and the player is at the pick-up window. 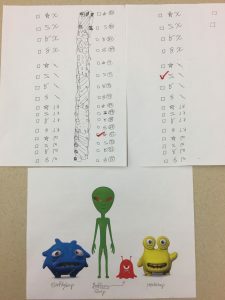 Getting the order: The robot hands the player an order form written in an alien language, and using a translation chart on the wall, players will decipher what the code means and then teach the robot the names of alien fruits as well as the color of the required fruit. Once the robot understands, it fetches the ingredient. Serving: The robot, since she got the order, knows who it goes to. She tells the player to give it to the alien as identified by race (Gloffglorp, etc). The player needs to learn from the robot how to identify the correct alien and serve it appropriately. Turns out that the experience was pretty fun and that, at least in these tests, there were no made-up words from the player end. With those encouraging results in mind, we decided to build out a playable prototype for our client/faculty meeting the next Tuesday. We’re off to the races with our new plan, and we’re excited since it seems to incorporate what we’ve learned and has the technology to bring it to life. Look for more updates next week!